After a second consecutive fantastic effort at Golden State against the Warriors in the western conference finals, the Rockets are left wanting more. Technically, they are wanting just about the only thing they didn’t get – a win. 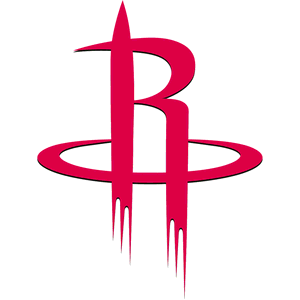 The Rockets fell by a scant one point, 99-98, Thursday night to the Warriors when on their final possession – the final possession – of the game, they were unable to even launch a potential game-winning shot. Trailing by one, after forcing a Harrison Barnes miss at the rim, James Harden grabbed the rebound and started heading downhill, looking for the win. He was met at the 3-point line by the Warriors star backcourt duo, Klay Thompson on Harden’s right, Steph Curry on his left. Not liking what he saw, in terms of a driving lane, Harden stepped back and passed the ball to his right to Dwight Howard, who immediately tossed it back to Harden with just under three seconds remaining. Thompson and Curry remained glued to Harden and after he took one dribble, he lost control of the ball. A brief scramble ensued, very brief, and he final buzzer went off. All the Rockets needed was two points and they would have gotten out of Golden State with the win they had to have. By not getting two points, they still need four wins to advance to the NBA Finals for the first time since winning the title in 1995. Harden, who was named first team all-NBA for the second consecutive season earlier in the day, had been brilliant up to that point. The Rockets found themselves in position to get the must-have victory on the road because of his 38 point night. Harden finished one assist shy of a triple-double, just as he did in game one, and pushed the Rockets to the brink of victory with every play he made in the final minutes. Right up until the final play, which he didn’t make. Heading off the court, Harden knocked over some temporary curtains back in the tunnel and described his frustration along with his teammates encouragement in the locker room. With just under three minutes to go, Steph Curry, who had 33 points in the game, drained a long jumper with his foot on the 3-point line to put the Warriors up eight points – their largest lead of the second half. Harden immediately answered with a 3-pointer to cut the deficit to five, 94-89. After assisted Andrew Bogut on a layup, Harden went to the free throw line and missed his only free throw of the game, but still closed the gap to six when he made his second attempt. The Warriors then bled 41 seconds off the clock, thanks to a questionable offensive rebound by Harrison Barnes, when it looked like Terrence Jones was knocked to the floor by Draymond Green. Curry capped that possession with his final points of the game on a step-back jumper from 22 feet out and the Warriors again led by eight. Now only 1:39 remained on the clock. Harden wasn’t done yet, again driving and drawing a foul. His free throws cut the lead to six and after Green made a one of two free throws, Harden drove again, this time finishing with his only dunk of the game. The deficit was five. A Barnes 3-point miss followed and Harden went driving again, got fouled, and drained two more free throws. The deficit dipped to three. Following his second free throw, the Rockets sent both Corey Brewer and Jones at Steph Curry trying to bring the ball up court, his initial pass was nearly stolen by Brewer and it ultimately led to an eight-second violation on Golden State and a huge turnover for Houston. No surprise what the Rockets did next. Harden drove right this time and despite both Thompson and Green draped all over him, he floated a perfect lob pass to Dwight Howard, who finished the alley-oop to make it a one-point game, 99-98, with 33 seconds remaining. Harden had scored 12 of the Rockets last 15 points, with the only non-Harden basket coming on the alley-oop pass he made to Howard. The Rockets then made their final big defensive stop of many down the stretch, followed by the shot that never came. Game three is Saturday night in Houston. The last time a team feel behind two games to none on the road in the conference finals and come back to win the series was the Oklahoma City Thunder, who beat the San Antonio in four straight games after losing the first two in 2012. Harden, in his final season with the Thunder, averaged 18.5 points per game on 49% shooting from the floor and 61 percent on 3-pointers in that six-game series against the Spurs. Similarly, Harden’s Thunder were the second seed facing the top seeded Spurs, just as his current Rockets are the two seed facing the top seeded Warriors. The votes are in – how’d I do? Now that all the major NBA awards have been announced, I’ll share how I did with my unofficial votes. My votes listed first, followed by the actual results. #Rockets Donatas Motiejunas finished 8th for most improved player. Got one second-place vote, 4 third place votes. Jimmy Butler won. #Rockets James Harden named 1st team all-NBA for 2nd consecutive season. 4 of 129 voters did not have him on 1st team. This series of tweets offers some analysis of voting breakdowns. Full voting results by voter can be found here. 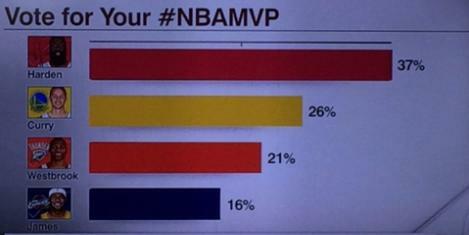 On SportsCenter Monday morning on ESPN, the MVP question was posed to former NBA coach P.J. Carlesimo and NBA writer J.A. Adande, along with a twitter vote. At USA Today, Adi Joseph explains how Harden has clawed his way to the top of the MVP heap. “The 6-5, 225-pound shooting guard flings himself into the lane, daring opponents to block his flailing shots without fouling him in the process. When he gets a clean look, he seems surprised. Flopping and offensive fouls are against the rules, but Harden knows their penalties and has accepted the risk of punishment. Only once in the last six seasons has the second leading vote-getter received more than six first-place votes. Seems safe to project at least one player other than the winner receiving more than six first-place votes. The winner received at least 90 percent of the first-place votes in five of the last six seasons. It seems unimaginable, that the pool of media voters will see things that similarly this season.